A thoughtful media kit for a thoughtful company. Brian Thompson of Black & Essington is thoughtful. He’s thoughtful in his career moves, in his educational moves and in his business. This thoughtfulness is what makes him so very good at what he does; advising other businesses about their strategies, their procedures and practices, and their best next steps. Brian needed a media kit but realized that most of his prospective clients and referral partners are investigating him digitally first – and almost exclusively. But that shouldn’t mean a basic, plain, boring document – how thoughtful is that? Tweaking his copy just a bit and encouraging a slightly more forceful sell, we designed a lovely 9-page media kit inspired by his website that details what Black & Essington does, how Brian does it and how he can help small to mid-size business grow in a positive, controllable manner. The imagery in the piece reflects his connection with Chicagoland and his workshop and seminar work and includes testimonials of satisfied clients. Visitors to his website can download the piece to view, to email or to print. Today, rather than extensive, beautifully designed packages that are snail-mailed, media kits tend to be digital pdfs. Instantly downloadable, these kits are faster, easier and less expensive. However, they should still be beautifully – and thoughtfully – designed. 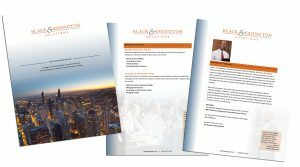 When your small to mid-size business needs help – with sales, with strategies or with management techniques, call Brian Thompson at Black & Essington at 815-557-1734 or email by clicking here.